Let’s not pack our bags yet though - the three celestial bodies actually perform much more daring orbits around their host star than even our Mercury, taking 5, 12 and 24 days respectively. And we all know what happened to Mercury because of its close proximity to the Sun. 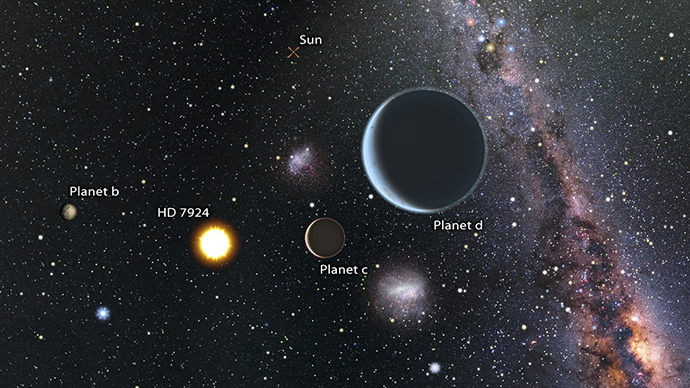 "The three planets are unlike anything in our solar system, with masses 7-8 times the mass of Earth and orbits that take them very close to their host star," Berkeley graduate Lauren Weiss said. "This level of automation is a game-changer in astronomy," astronomer Andrew Howard, based in Hawaii, said. "It's a bit like owning a driverless car that goes planet shopping." "We initially used APF like a regular telescope, staying up all night searching star to star. But the idea of letting a computer take the graveyard shift was more appealing after months of little sleep. So we wrote software to replace ourselves with a robot," BJ Fulton, a graduate at the University of Hawaii, was cited as saying.